Does he/she still love me? Something our psychics get asked a lot by our customers are questions revolving around love; does my partner still love me, are they going to leave me and are they cheating on me? Our professional love tarot psychics may be able to help shed some light on your love dilemmas and offer some guidance, support and clarity to what may lie ahead. Chat to our love tarot psychics today. Text a love psychic now! All our readers have been hand picked for their skills and friendly nature. Browse our readers and make a note of their PIN number. Once connected, follow the prompts until connected to your chosen reader. Now relax and prepare for your live phone tarot reading. Some tell tale signs that your partner still loves you! It's in their eyes – a mere look can give away a lot. It's that look that is only reserved for you and you alone! They want to be part of your life and share it with you – be a part of your family, share your hobbies and to be around for your future. Absence makes the heart grow fonder and when you're apart you really miss each other and yearn to stay in contact with each other. They will always be there for you and are willing to drop everything if you need them to. They don't give up even in the roughest of times. You can share the fun times together and laugh. More importantly you are happy sharing the quiet times and feel comfortable together. 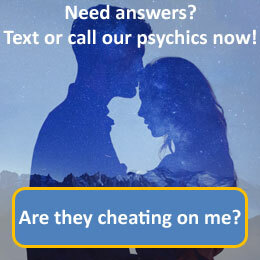 Our love tarot and psychic readings offers a freedom of choices for our callers and it is only you that can change your destiny – our psychics can only offer advice and guidance.